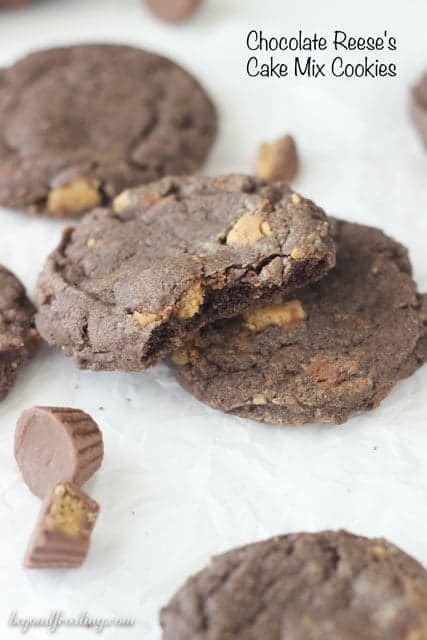 These Chocolate Reese’s Cake Mix Cookies are soft-baked using a chocolate cake mix and are loaded with Reese’s Peanut Butter Cups. If I bake a recipe that is Boyfriend-Approved, you know it’s going to be good. I typically load my desserts with a lot of “extras”. Frankly, he’s just not that into it. 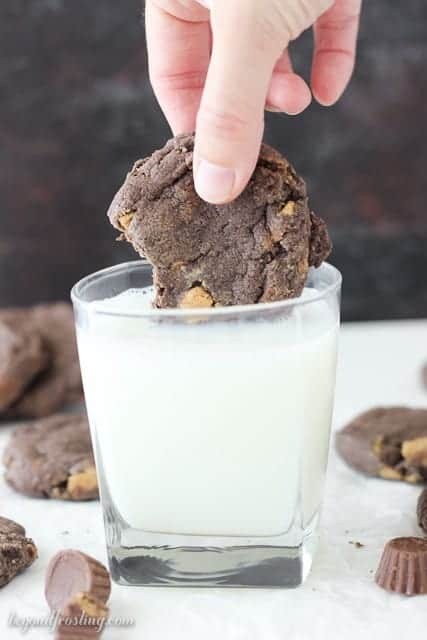 He will ask me from the couch what I am making and I tell him, “Chocolate cookies” and he’s all, “Yeah? !” and I’m all, but I’m adding this, this and this, and he just sighs and turns back to whatever he’s doing. So when I told him I was making Chocolate Reese’s Cake Mix Cookies, I was expecting the same reaction. Until he tried one. “These are real good” he said as he stuffed his face [Editor’s Note: I did say “These are real good,” and they absolutely are, but I am offended by the unflattering characterization of the way I consume cookies. Rude.]. I watched with a smile on my face. 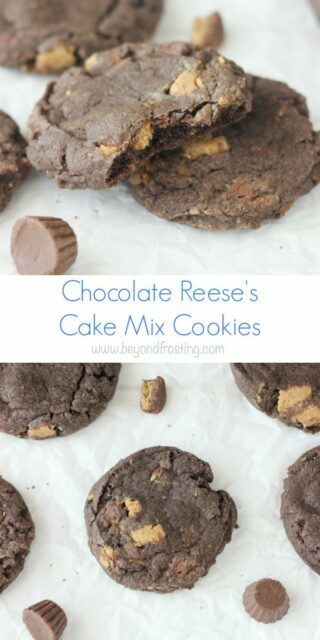 To create these Reese’s Cake Mix Cookies, I chopped up Reese’s Peanut Butter Cups and mixed them right into the dough, so every bite has peanut butter and chocolatey goodness. I was a little late to the party on the cake mix cookies and I’m making it up for it now. 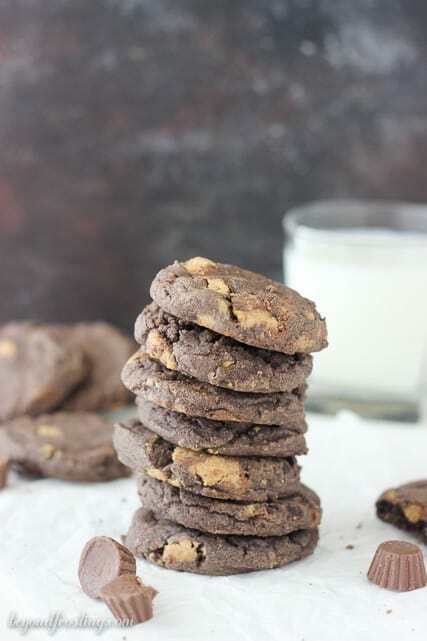 The cake mix helps keep these cookies super soft and chewy in the middle. These are TOO good. I made these cookies as part of the OXO Cookies for Kids Cancer campaign. OXO is a huge supporter Cookies for Kids Cancer and I am so happy to be participating in spreading the word. In 2015, OXO will donate up to $100,000 to Cookies for Kids’ Cancer through product proceeds, bake sale matches and other fundraising efforts. 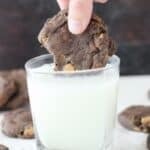 For each blog post dedicated to this campaign, OXO is will be donating $100 to Cookies for Kids’ Cancer. OXO was kind enough to send me some goodies to help me with my baking. 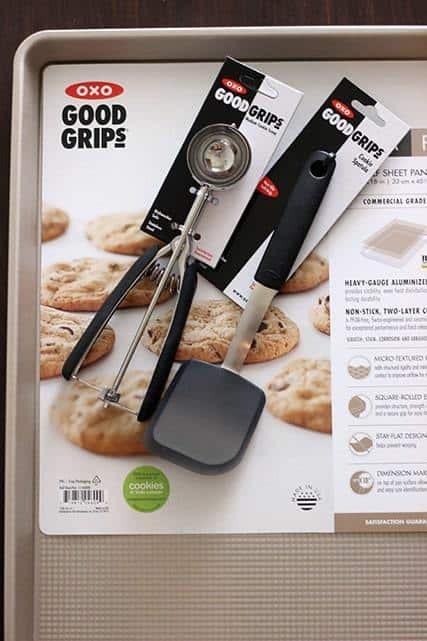 You can look for the Good Cookie Logo on participating items. I live by my cookie scoops to help make the perfect scoop every time. See my Pumpkin Cream Pie Cookie Cups from last year? Cookie scoop all the time. These cookies are good for anytime of the year, but if you are sending for the holidays, consider wrapping these up in some cute packaging. 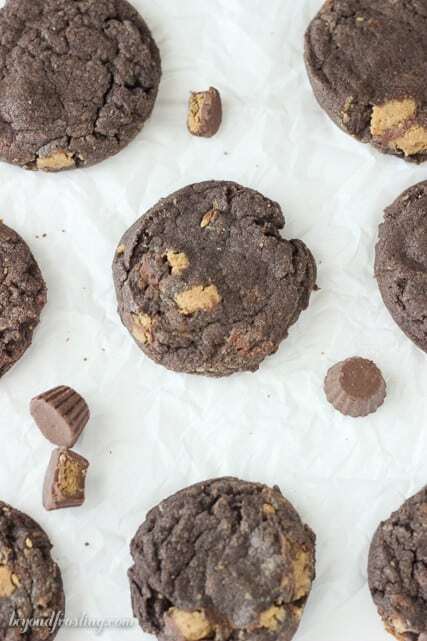 These Chocolate Reese’s Cake Mix Cookies are soft-baked and loaded with Reese’s Peanut Butter Cups. 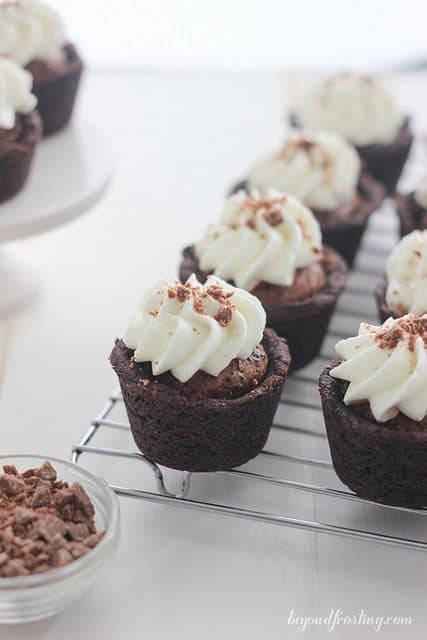 In a medium-sized bowl, combine dry ingridents: flour, cake mix, baking powder, salt and cocoa powder. Stir and set aside. Soften butter in the microwave for 15 seconds. Combine softened butter and sugar in a large mixing bowl. Beat on medium speed until light and fluffy, 2-3 minutes. Add egg and vanilla extract and beat until well combined. Reduce mixer to low speed and slowly add dry ingredients and mix until dough forms. Turn off mixer. Unwrap and chop up 15 Reese’s Peanut Butter Cups into pieces about the size of a dime. Add to dough and turn mixer on low speed just until peanut butter cups are combined. Spoon 2 tbsp of cookie dough (per cookie) onto a lined baking sheet. Bake at 350° F for 10-12 minutes. Allow cookies to cool on the sheet for several minutes before transferring to a wire rack. Cookies for Kids’ Cancer is a recognized 501c(3) public charity duly incorporated under the laws of the state of New Jersey. Your donations are tax deductible to the fullest extent allowable by law. 100% of proceeds raised by Cookies for Kids’ Cancer fund pediatric cancer research. OXO will be donating $100 to Cookies for Kids’ Cancer for each blog post dedicated to this campaign in October (up to our $100,000 commitment*. 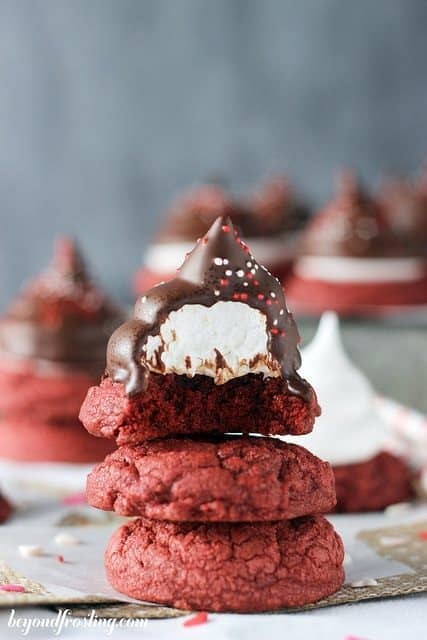 Can’t wait to try these at our annual Christmas cookie bake. Question:the cocoa powder measurement, It says “2tbsp C Dark chocolate cocoa powder”but what does the capital C indicate? I don’t want to mess the recipe up. Can you help me with this?, thanks. Hi Nancy, thank you for pointing that out! It is 2 tablespoons. I love how easy these are to make and I love OXO Products! What a great campaign they are running! These look really good! What a great cause too! The reese’s sold me!! I don’t care how many extras they may have.. I can’t so no to reese’s!! These cookies are so fun! 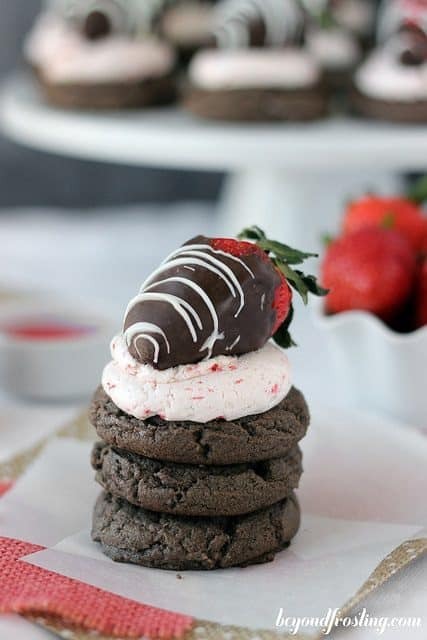 Love that you made these with cake mix! Great cookie! Great recipe! And so nice to be including this in the Cookies for Kids Cancer effort.